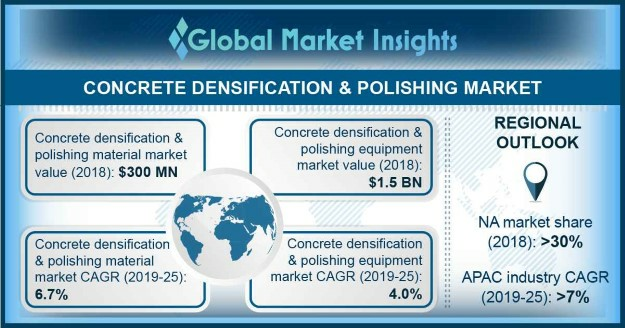 Concrete Densification & Polishing Material Market size is poised to surpass USD 450 million by 2025, Concrete Densification & Polishing Equipment Market will exceed USD 2 billion by 2025; according to a new research report by Global Market Insights, Inc.
Uplifting construction sector, predominantly in the BRICS countries will bolster the overall concrete densification & polishing market demand in future. The construction sector revenue in BRICS countries was roughly around USD 2.5 trillion in 2018 and will likely mark close to USD 8 trillion in 2024. In 2015, China held about 50% revenue of entire construction industry of these five countries and will dominate the global market with several upcoming infrastructure and construction projects. Flooring is an essential part of commercial and residential structures and holds significance in applications across residential houses; commercial places such as shopping malls, workplace, retail stores, and hospitals; transit system infrastructures including railways and airports; and various manufacturing and warehousing facilities. Concrete densification & polishing material and equipment are widely employed in construction structures to offer superior resistance from fire, harsh climatic conditions, damp, and abrasions. The market development may be hindered by the popularity of other flooring solutions such as floor tiles and marbles which provide superior aesthetic appeal, although at a higher cost. However, longer life and ease of maintenance of concrete floors will play a significant role in the market growth. Concrete densification & polishing material market is fragmented into product and end-user. The product segment is divided into conditioners, densifiers & hardeners and sealers & crack fillers. Densifiers & hardeners will clutch more than 35% volume share of the total market by 2025. The end-user segment includes industrial, commercial, institutional and residential buildings or structures. Commercial end-use segment will capture more than 30% of revenue share in concrete densification & polishing material market by 2025. Significant growth in transportation industry will significantly boost the flooring applications in the commercial sector such as airport, metros, bus stops and railway stations. Concrete densification & polishing equipment market is segmented into three products which include ride on, hand held, and walk behind floor grinders and polishing machines. Ride on grinder and polishing machine is one of the major segments and is likely to grow with close to 4% CAGR in coming years. Europe concrete densification & polishing equipment market revenue is likely to reach more than USD 450 million by 2025. Surge in remodeling practices in residential and commercial segments is the key factor contributing the significant demand in the region. Elevating building construction businesses in various developed and developing economies of the region will boost the overall market growth. The prominent players in the concrete densification & polishing equipment market are SASE Company, Diamatic, Bosch, Canzac, Husqvarna AB and others. Euclid Chemical, Concrete Earth, Markham Global, and Canzac are some of the key material manufacturers.